The afterlife of Jaufré Rudel: Princess Daisy? 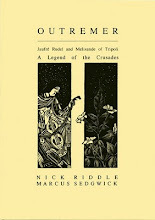 Alphonse Mucha wasn't the only visual artist to go to work on the Rudel legend. 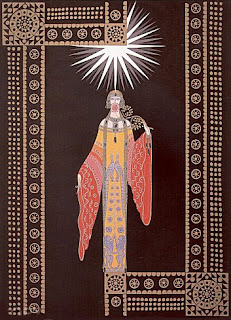 The French-Russian designer and artist Romain de Tirtoff (1892–1990), better known as Erté, produced a number of limited-edition prints towards the end of his life, one of them entitled La Princesse Lointaine (right). 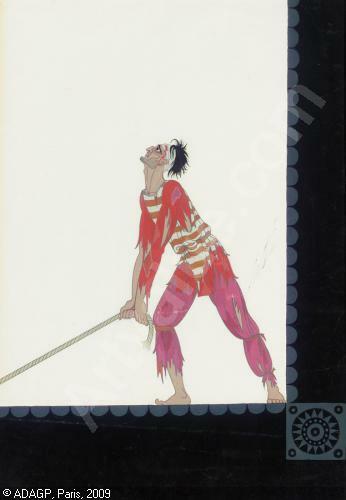 There seems to be no information as to whether he had the Rostand play in mind or something more generic, either for this or for an earlier print with the same title (printed in 1970). However, an art auction site lists a couple of costume designs by Erté for a production of La Princesse Lointaine, dating from 1929 (below right: 'Costume design for Second Mariner'). This suggests that there was a revival of it that year, though it seems a bit unlikely. The 1984 print is a throwback to Erté's Art Deco heyday, to the extent that his princess rather resembles a 1920s flapper. Incidentally, the wikipedia entry for 'Princesse lointaine' -- the 'stock figure from literature' -- makes reference to Daisy Buchanan, Jay Gatsby's inamorata, as a 20th-century example. 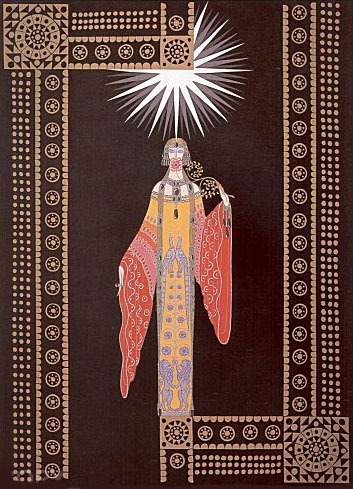 So maybe Erté's 'Princesse' approximates how Gatsby imagined Daisy.